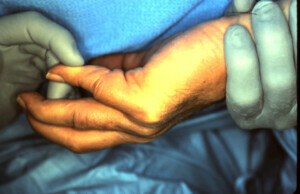 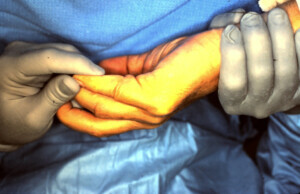 Dupuytren’s disease affecting the right ring and little fingers. Lateral view demonstracting contracture of the little finger metacarpophalangeal joint of approximately 80 degrees. The ring finger is also involved but to a lessor degree. 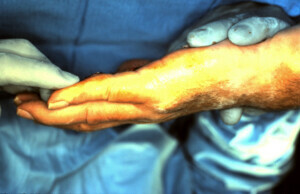 Volar or palmar view of the contractures with the intended incisions marked out. 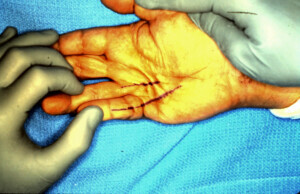 Closure will incorporate Z-Plasty’s to lengthen the skin at the flexion creases. Dissection begins by raising the skin off of the diseased palmar cord which is visible in this photograph. The diseased fascia must be completely and meticulously removed by freeing and protecting the vital neuro-vascular structures. 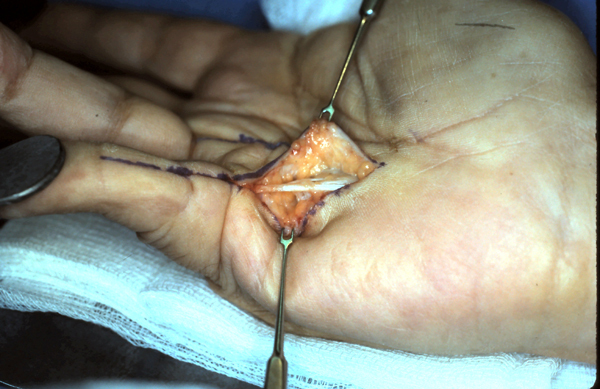 Intra-operative view demonstrating complete extension of the ring and little fingers after complete removal of all the diseased tissue.